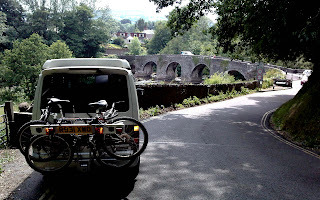 Wales is fast becoming one of the very best destinations in Europe for Biking, and a brilliant way to explore the trails and cycle routes is to hire a Mazda Bongo Campervan from GoBongo. For the perfect bike holiday or weekend, take our Thule 2-3 bike carrier as an optional extra with either of our amazing vans. The carrier can be locked on for security, but mounts on and off easily, and can be tilted down to give access to the rear van door with bikes still mounted. Please note that as the bike rack mounts on the towbar of the vehicle you will not be able to use the luggage trailer or back-box with this option, so it is really more suited for couples and serious cyclists who want to travel light. However, if you need the additional space of our awning and other luggage options for your family you can still enjoy cycling on your holiday as you will find a huge range of bike hire shops now at destinations all over Wales. For truly world class mountain biking try out trail centres like the original Coed y Brenin (the Kings Forest) in North Wales, which attracts over 150,000 riders a year. Closer to our base in South Wales you can choose from even more trails at centres like Afan Forest Park, the recently opened Bikepark Wales, or the Brecon Beacons. And why not try out Cwmcarn Forest, which has a handy campsite at the base and a breathtaking downhill track with uplift service, all less than 20 minutes drive from our base? 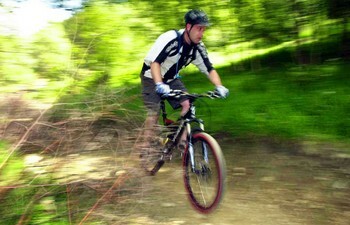 To see more about mountain biking check out our playlist videos on the GoBongoUK YouTube site. 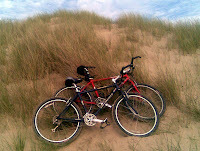 Don't forget Wales and the Southwest also have miles of conventional cycle paths if you want rides with a bit less adrenalin, but still with the same sensational views and fresh outdoor air. So get to Wales in our Bongo Campervan and find out why cycling holidays are one of the fastest growing ways to experience the great outdoors.